An artist's illustration of the Landsat 5 satellite in Earth orbit. Landsat 5 has secured a new world record title for being the longest-operating Earth observation satellite after almost three decades in orbit. Guinness World Records sent an email confirmation to NASA's Goddard Space Flight Center in Greenbelt, Md., informing space agency officials of the honor, NASA officials said in a statement. 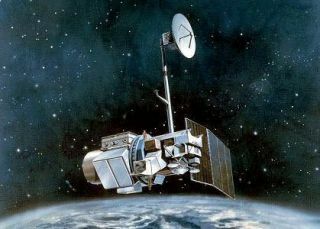 Landsat 5, which will be retired in the next few months, launched on March 1, 1984 and has long outlived its initial three-year mission. The satellite has circled Earth more than 150,000 times during its nearly 29 years in space, and has snapped more than 2.5 million images of the planet's surface along the way. "This is the end of an era for a remarkable satellite, and the fact that it flew for almost three decades is a testament to the NASA engineers who launched it and the USGS team who kept it flying well beyond its expected lifetime," Anne Castle, Department of the Interior Assistant Secretary for Water and Science, said in a statement. This Landsat 5 image shows the Columbia Glacier in Alaska, one of many vanishing around the world. Glacier retreat is one of the most direct and understandable effects of climate change. Last year marked the 40th anniversary of the entire Landsat program, a collaboration by NASA and the U.S. Geological Survey, which has helped scientists document the changing face of our planet and humans' impact on it, from ice loss to natural disasters to urban expansion. To date, NASA has launched eight Landsat satellites under the program, which is a joint effort with the U.S. Geological Survey. Landsat 7, which launched in 1999, has also outlived its three-year design and remains operational. The program's eighth satellite, the Landsat Data Continuity Mission (LDCM), just launched on Feb. 11 from Vandenberg Air Force Base in California. It rode a United Launch Alliance Atlas 5 rocket into orbit without any hitches. Throughout its 29-year history in space, Landsat 5 faced its share of challenges, including battery and star tracker failures, as well as the loss of on-board data recording, NASA officials said. The satellite's flight control team found solutions to those issues, they added. "The efforts of the Landsat team were heroic. Landsat 5 could not have lasted so long without the dedication and devotion of the USGS flight operations team that overcame a number of difficult technical challenges over the last 12 years," Jim Irons, LDCM project scientist, said in a statement from NASA on Feb. 10. "Landsat 5 saved the Landsat program," Irons added. "This satellite's longevity preserved the Landsat program through the loss of Landsat 6 in 1993, preventing the specter of a data gap before the launch of Landsat 7 in 1999."